Donald Trump deserves credit for creating a moment that could – maybe – escape the madness of destruction. The handshake lasted 12 seconds, body language experts tell us. 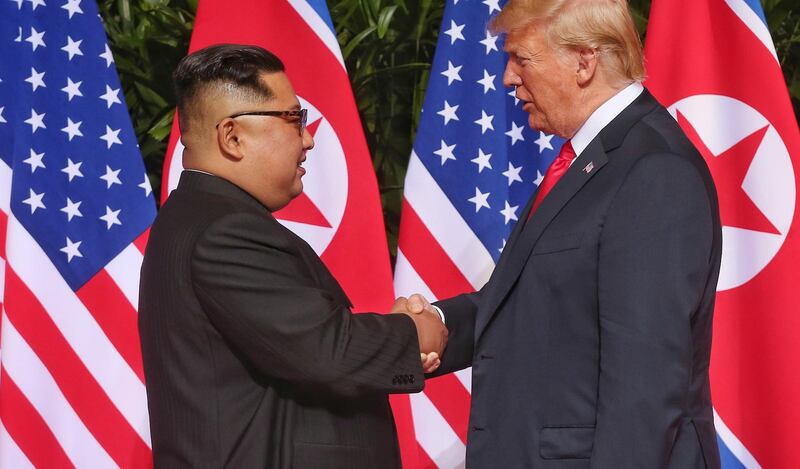 That’s not quite the full minute Donald Trump had predicted it would take him to judge whether Kim Jong-un was ready to make a deal, but whatever the substance behind the showcase, this summit is indeed an extraordinary moment in time. And there are pictures aplenty. Close observers are doubtless correct that the North Korean regime has benefited merely from the fact of the summit, the initial 41-minute meeting, plus a walk-by for the cameras. From the flag-by-flag backdrop to the parade of black limousines, the Supreme Leader of North Korea has the look of an equal in symbolic status to the President of the United States. But such trappings of regal diplomacy (and there is an archaic aspect of royal pageantry that surrounds any state visit) do not seem that much to surrender if this becomes a moment to shift a stubborn enmity. We know Kim is an odious thug who cemented power with strikes against his neighbour and assassinated his half-brother. We know Trump suffers a bloated ego. But both men might just have created a special opportunity here that no amount of official haggling was ever going to produce. It is certainly fair to criticise the lack of formal preparation in the lead-up to this surprise summit (well, a surprise when it was announced and, frankly, that it has even taken place). That lack of preparation, where elementary differences are ironed out, allowing the leaders to decide the final terms, could see this whole enterprise quickly unravel. Or you could criticise Trump for driving a crisis last year, only to then want credit (a Nobel Prize even) for talking peace – although that would ignore North Korea’s missile volleys. Perhaps worse are suspicions that the deliberate intent was to rush the talks and see them fail, to show diplomacy had been exhausted and clear the way for war. But it must also be acknowledged that the trajectory of the situation on the Korean Peninsula until this year was hardly healthy, treated as some kind of petri dish for crisis management, a problem that could continue to be managed, simply for the reason that it had been managed before. If Mutually Assured Destruction is the logic of nuclear deterrence, maybe it will take a MAD idea to break it. Where Trump deserves credit is that an idea this bold, crazy, or brave was never going to emerge from the careful planning of the bureaucracy. No bright spark junior diplomat was ever going to be able saunter up to a superior one day and try and convince her to sign-off on a submission that the President offer to meet the leader of North Korea. It would, in the droll humour of officialdom, have been a Career Limiting Move. Yet here we are. Only leadership, however flaky, was going to move beyond suspicions that had come to define this problem. A lot of pressing questions are yet to be answered, terminology defined, and true intents judged. Any number of reasons or developments might doom this notional negotiation to a blunder of epic stupidity. But as a moment in time, I’d sooner see a clown president and chubby-cheeked despot, both with nuclear arsenals, shake hands, sit down, and talk in person than fire rhetorical salvos across the airways, or something far worse. China’s political elite know that this is only the beginning, but have several reasons to be pleased. While international attention is focused on elections, more substantive change is likely to happen in European security policy.